Prospective Military Retirees face a bevy of choices on the road to retirement. Among the more important - and complicated - is the Survivor Benefit Plan (SBP). The SBP is sometimes given only a cursory explanation during T-GPS (Transition Class) followed by a form to fill-out. Clearly, sometimes important details are missed. Before proffering any sort of suggestions about the SBP, it is critical to have an academic understanding of the program. For that, I recommend the following website: MOAA SBP Article. MOAA's SBP article is concise, articulate, and an excellent primer on the program. For the remainder of the article, I will attempt to put some numbers to the options to perhaps assist with making a wise choice regarding SBP. Any reader should know that EVERY circumstance is different, thus seeking professional advice regarding the SBP is encouraged. In most cases, SBP elections are sort of permanent, so you want to get it right the first time. He is married with a young child. Financially: above average retirement savings, no credit card debt, a mortgage, and an executable budget past retirement. Health-wise: no significant issues curtailing life expectancy for either he or his wife. His son has no special needs. As we know, the SBP premium is up to 6.5% of Gross Retired Pay. Retirees can elect a coverage amount of $300 up to 55% of Gross Retired Pay. Also, and this is a key point, SBP Premiums are taken out pre-tax. Therefore, if a retiree elects not to participate in the SBP, the funds available for an alternate strategy will be reduced by federal - and perhaps state - income taxes. Our retiree will pay a monthly premium of $286, thus reducing his annual pension check. In return, if he passes away, his spouse will receive $2,423 for the remainder of her life with inflation adjustments. If the retiree opts out of the SBP, his $286 premium - assuming the 30% tax-rate - would be reduced to $200, which is added to his paycheck. More spending. Our retiree can simply add this to the family budget with no consideration given to what impact his demise will have on his family. Term Life Insurance. Prices can vary widely; however, a recent quote for a slightly older retiree yielded a $500,000, 20-Year Term Life Policy for $200 per month. To reiterate, this is only one example, insurance quotes for any reader may be vastly different. It is not inconceivable to secure a 30-year, $1.5 Million Dollar policy for the same amount of premium. Permanent Life Insurance. Again, rates can vary widely AND there are a plethora of permanent life products available. That said, a recent quote for Universal Life Policy I saw yielded a $250,000 Death Benefit for the $200 monthly premium. Invest for the Long-Term. For this article, we will assume the Retiree invests $200 per month into a low-cost S&P 500 Index Fund that averages a 5% return over the illustrations provided. Obviously, real returns will never be 5% per year every year. However, the presentations here are to provide a frame of reference of what a monthly $200 investment plan can achieve. Moreover, the intent of this savings program would be to provide annuitized income for the Retiree's widow upon his passing. Purchase an Annuity. For this option, we will assume the surviving spouse purchases an Immediate Annuity with the invested funds upon the Retiree's death. This will yield a monthly (inflation-adjusted) payout for the remainder of the Widow's life. You can run your own simulations here. A sea of numbers here. To clear things up a bit, let's look at Year 10 of retirement. Retired Pay is easy enough, $60,453 Gross. The Retiree would receive that amount if he opted out of the SBP. 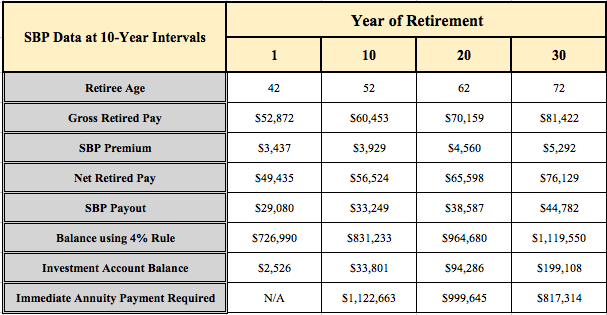 Conversely, if he opted in, Retired Pay would be reduced to $56,524. SBP participation would yield an annual payout to his spouse of $33,249 in the event he passed away. In the line titled "Investment Account Balance", this is simply the "Future Value" calculation of $200 per month with a 5% rate of return starting from a $0 balance. As you can see, this amounts to $33,801 after 10 years. In the line titled "Immediate Annuity Payment Required", this is the amount needed to invest in an Immediate Annuity to yield the SBP Payout. So in this case, if the Retiree passed away in Year 10, his widow would have to invest $1,122,663 in an immediate annuity to yield the $33,249 payout (with inflation adjustments). To be fair, I am simplifying here as Annuity payments have a taxable and "Return of Principal" apportionment, thus changing the net payment somewhat. However, there are also fees to consider, which I do not address. I feel this is an accurate representation of the point I am attempting to illustrate...Full Disclosure: I DO NOT sell any insurance products. In the line "Balance Using the 4% Rule", I am referring to the widely-held assumption that an investor can withdraw 4% of an investment account with the expectation that the account will last for 30 years before depletion. This "rule" has many caveats - namely the 30-year horizon - and other limitations (i.e. Sequence of Returns Risk and a 50/50 Portfolio) which are beyond the scope of this paper. For this article, the 4% Rule can roughly illustrate the point that the investment required to produce the SBP Payout is the Payout amount divided by 4%. Or more simply, the payout multiplied by 25....the math works out the same. So in year 10, to achieve a $33,249 Payout adhering to the 4% rule, the widow would need an account with a value of $831,233. 1) The SBP Premium does not buy much Term or Permanent Life Insurance. Therefore, I would have a wary eye on a strategy of using only Insurance to replace SBP in a financial plan. 2) Investing your After-Tax SBP Premium will likely not replicate the SBP. If the Retiree's intent is to actually provide a monthly payment equal to 55% of his Pension for his widow, simply investing what would have been the SBP premium is a tough way to get there. You can see from the table above that a 5% return - to be sure, a conservative assumption - only gets you to $199,109 after 30 years. This amount will not come close to replicating the SBP payout using either the 4% rule or the Immediate Annuity Method. To be fair, when investments are in the offing, there is always a return that is so "good", it will achieve most anything. In this case, the return assumption one would need to reach parity with the SBP would be be about 15%. Any reputable Financial Planner would tell you this return assumption is fantastical. Anything is possible, though please do not assume this rate of return in your calculus. 3) The amount required to purchase an Immediate Annuity will gradually decrease as the Retiree and his spouse age. This is to be expected since Life Expectancy in terms of the number of years remaining decreases with age. So, if the Retiree has ample assets in his portfolio, then foregoing the SBP and supplementing an already burgeoning portfolio might - repeat might - make sense. 1) As you can see from the numbers above, the SBP is difficult to match with other products. So don't overthink it - if your goal is lifetime income for the entirety of both spouses' lives, the SBP does the trick at a fair cost. 2) The average Retiree leaves the service in his/her early 40s. Assuming the Retiree is healthy, he/she has a life expectancy of over 40 more years. Therefore, if a Retiree elects to participate in the SBP, he/she will pay premium for "only" 30 years. Then, when life shorteners start to crop up - heart disease, cancer, etc. - SBP will be paid up with no other premiums required. So if the widow significantly outlives the Retiree, the SBP benefit will further inure in her benefit with each passing year. 3) For those entering Military Retirement with medical conditions suggesting curtailed life expectancy, the Survivor Benefit Plan is an option you should strongly consider. For starters, there is no underwriting, so any retiree can elect to participate - this is a big deal if you are otherwise uninsurable. Also, since Widows receiving SBP payments do not pay any further SBP premiums, the SBP is seriously beneficial to the widows of Retirees who suffer premature death. Think about the illustration above in the extreme: if the Retiree died in a car wreck on the way home from his retirement ceremony, he would have paid $286 for his spouse to receive a $29,080 inflation-adjusted annuity for the remainder of her life. 4) Another point to consider - and this is a big deal - is Long Term Care. For one reason or another, Long-Term Care is frequently ignored in Financial Planning....this is a serious mistake. Indeed, there are many options to address Long-Term Care...I would argue the SBP is on that list. If you were to shop for a Traditional Long-Term Care Policy today, $286 is likely to provide somewhere between a per day benefit of $100-$300. Again, there are a myriad of factors related to Long-Term Care insurance. My point here is that if a Retiree Spouse is otherwise uninsurable - Cancer Survivor and Osteoporosis come to mind - then the SBP is a way to provide Long-Term Care-like benefits for a similar premium. Obviously, if a spouse's life expectancy is expected to be curtailed due to a previous illness, Long-Term Care is perhaps not an issue. However, if the Retiree's spouse predeceases him, SBP premiums would cease. Every case is different. 5) For Retirees with dramatically younger spouses, the Survivor Benefit Plan (SBP) may be for you. Again, using an extreme example (no judging please), a 43 Year-old Retiree starts a family upon retirement by marrying a 25 year-old with a plan to have 2 children. Clearly, his wife and children have much longer life expectancies. Therefore, this situation would suggest SBP participation. 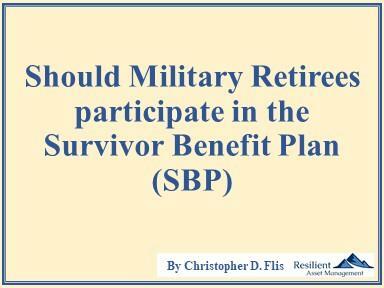 I have seen many presentations suggesting there are superior alternatives to the Survivor Benefit Plan (SBP). Assuming lifetime income is the goal, to date, I have not seen convincing numbers, products, or rationale for not participating in the program. For those who expect to be financially independent approaching 70 with a paid-off house, no consumer debt, and investments galore, perhaps the SBP is not for you. For those of more modest means, the SBP premium is a small price to pay for income security. And even better, should you and your spouse live to a very ripe old age, you will both have the comfort of knowing each of you has a lifetime income source. For all you may have read in this article, I cannot stress enough how unique your situation is. Simply put, if there is any doubt, there is no doubt, seek professional assistance if you are unsure of what to do. While there are mechanisms for backing out of the program or opting back in once you decline, those opportunities are rare and should not be relied upon to fix poor decisions. So get it right the first time.